Wild geese, with their ability to fly great distances can represent freedom;4 at the same time their migratory habits led Chinese literati often to use them as an allusion to exile.5 As those in exile are likely to dream of the freedom to return, the two themes often go together. This is true whether the geese are referred to as "hong"6 or by the more common word, "yan".7 Thus, the theme of exile is one aspect of the very popular melody Pingsha Luo Yan (Wild Geese Settle on a Sandbank). The melody Wild Geese in Autumn shares some of the imagery of that melody, and this may have led to some confusion between the two. An imperial edition of qin tablature for Qiu Hong (part of one image is at right, with a link to further details) may have contributed to this confusion. The tablature there is divided into four folios, titled Ping, Sha, Luo and Yan. In addition, the pages seem to have been somewhat scrambled, with the contents of folio one switched with that of folio two. Generally, though, the tablature follows that of the Shen Qi Mi Pu (1425) edition, while the section titles largely follow those in Wugang Qinpu (1546). Tracing the history of Qiu Hong, it does not appear to be an ancient title, though there are references to wild geese in autumn in earlier poetry. 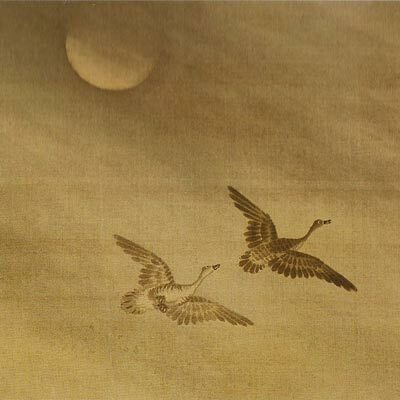 As for the word hong (wild geese), the first poem in the third Xiao Ya section of the Book of Songs (#181) begins, "The wild geese (hong and yan) are flying." A commentary adds that a large goose would be called hong, while a smaller one would be called yan, and books can be found illustrating this hong, but eventually the word hong came to be commonly used only for its extended meanings, like"large" or "grand". Sections 15 and particularly 27 have instructions such as are not found in other early (or perhaps late) qin pieces. What Zhu seems to be saying here is that there is a particular way of playing this piece, and to get it right, one really should have a teacher who knows how to play it. This, together with Zhu's strenuous efforts to make corrections to the tablature in his possession, is a strong argument that the aim of the handbook is to recreate the way pieces were played in the past (or at least by one's teacher). Unfortunately there is no information about who were Zhu Quan's qin teachers and what he actually learned from them. Unlike the only potentially longer piece, Guangling San (see Folio I),18 Qiu Hong obviously was actively played during the Ming and Qing dynasties: the changes in the 33 surviving versions to 1910 prove that. By the end of the Ming dynasty it had already changed quite a lot. of the long qin melodies, this can be called the longest piece besides Guangling San. (Qiu Hong) draws on lofty and far-reaching ideas, with the mind wandering in the cosmos, so that one's aim is in the Milky Way. The man of distinction and the elevated scholar, with their other-worldly talents, (but) equipped with knowledge from the common world, (feels he is living) in a time inappropriate (to his talents); knowing that the Dao is not prevailing, and believing this Dao is about to be destroyed, he remains nobly detached from his own distress; wanting to flee to a place where he can hide in secret, and feeling ashamed to mix with ordinary society, he seeks to emulate the wild geese of autumn, rising into the bright empty (sky), going into the azure mist, extending his journey over the four seas, finding release amongst the rivers and lakes, and keeping himself pure throughout the world; and thus was this melody written. but they still do not forget their old home! otherwise how could they proceed in an orderly fashion? they rise to touch the dark sky above. (i.e., they will never sponge off wealthy friends while avoiding the poor). how can one live an ordinary life with vulgar people! to nurture my passionate soul so that it becomes brighter. who else could (thus) extol (the wild geese)? just a "child of heaven" (i.e., member of the royal family) who is crazy about poetry. and so I made some pleasant sounds over this." 47821 鴻 hong defines it as either 鴻鵠 honggu, a sort of bean goose (including a sketch apparently by Swinhoe, who gave it the Latin name anser segetum serrirostris); or 黃鵠 huanggu, a large crane-like bird. For both there are several classical references. 25505.616 秋鴻 Qiu Hong has no musical references; it quotes several poems, one by 沈約 Shen Yue (441-513). Xu Jian, Qinshi Chubian, discusses the melody on pp.135-8. For more on this mode and other modes with this tuning see Shenpin Guxian Yi; for early modes in general see Modality in Early Ming Qin Tablature. This is from an undated publication in the old library of the Forbidden City. It has illustrations of the 36 sections of the melody Qiu Hong (Wild Geese in Autumn) divided into four folios, entitled 平 Ping, 沙 Sha, 落 Luo and 雁 Yan. These have been reprinted in at least two publications, a facsimile edition and as part of a book entitled Zithers of the Forbidden City. As an example, Alfreda Murck, Dissent, p.78, mentions a relevant poem by Du Fu. 47821/1 has an illustration (鴻圖 hong tu, which usually means "far-reaching plans") identifying the hong as anser segetum serrirostris, a term (and perhaps illustration) apparently taken from Robert Swinhoe, who saw one near Xiamen in about 1870; this bird is more commonly called anser fabalis, or Chinese bean goose. 47821/2 then gives the above quote from The Book of Songs (鴻鴈于飛 hong yan yu fei), explaining that this hong refers to 黃鵠 huanggu, a type of snow goose. This attribution is not found in Zheyin Shizi Qinpu (1491), which has the same tablature. More likely is the attribution to Guo Chuwang (next footnote). The similarity of the Shen Qi Mi Pu version to the Palace edition, combined with the what seem to be the mistakes in the latter (note especially Section 10), suggest that perhaps Zhu Quan's version was a revision of the Palace edition. Guo Chuwang's tablature; fixed and touched up by all the Xu masters. Qingshang mode. There are also suggestions in the imperial illustrated edition that the melody came from Guo Chuwang. In this case one must consider the possibility that Guo's version entered the palace before the publication of Shen Qi Mi Pu and Zhu Quan's tablature is an edited version of this. Even if this is true it does not answer the question of whether versions such as that of 1546 were copied down later after being modified via oral or other tradition. The appendix below is based largely on Zha Guide 10/102/158. 11. Connection to 平沙遠落 Pingsha Luoyan? See Xu Jian, op.cit., Chapter 7.B. (p.139). Section 15 of Qiu Hong is Yuan Luo Pingsha (遠落平沙). This melody survives only in Longhu Qinpu (1571) and in Yixuan Qinjing (late Ming). Under the melody title in Yixuan Qinjing it says Qiu Sheng 即秋聲賦 is the same as Qiu Sheng Fu; the edition in QQJC (IX/444) has only Section 1 and the first two lines of Section 2, but this shows it is the same melody as in 1579, thus unrelated to the Qiu Sheng Fu of 1589, a qin song using standard tuning. Zha Guide makes the same mistake. The tuning for Qiu Sheng, which has 13 titled sections but no lyrics, is called Nanlü but is the same as the guxian tuning of Qiu Hong. According to its preface in Longhu Qinpu, where it is the 25th melody, Qiu Sheng, 亦名擬秋鴻 also called Ni Qiu Hong (Imitating Autumn Geese), was created by Shi Yuezhou (Longhu Qinpu consists of his repertoire). The preface goes on to give some description of how it imitates Qiu Hong, and indeed it does use a lot of musical material from that much longer and more famous melody. Yanmen Pass is at the western end of 恒山 Hengshan, a mountain range in northern 山西 Shanxi province that is considered the northern "sacred mountain". It was traditionally considered to be the northernmost point to which geese went in summer. 15. Zhu Quan apparently considered his post in Nanchang a form of exile. 16. For long pieces see further below. 17. The painting above shows someone playing the qin at Zhu Quan's grave near Nanchang as ghostly geese fly overhead. 20. See the original Chinese preface. 25230.115 祝融峰 Zhurong feng is the highest peak in 南嶽衡山 the Heng Shan range in central Hunan; it is named after 祝融 Zhurong, the fire god, giving zhurong the extended meaning of hot weather. 22. See the original Chinese section titles. <1491, with the identical melody, adds lyrics throughout. Based mainly on Zha Fuxi's Guide, 10/102/158. (1546; I/459; NIML) 36T (section titles mostly same as with illustrations); music modified from 1425, or a separate tradition? Melody seems to have many of the same motifs, but this must sound different in this tuning! (1876; XXV/587) Preceded by "秋鴻原辭 original lyrics for Qiu Hong"
Return to the top, to the Shen Qi Mi Pu ToC or to the Guqin ToC.